My tehnaku gained many friends along the way. It was praise and critiqued, encouraged and challenged. These were absolutely precious experiences; they let me learn more about the reality of this world. They have been a training of sorts, augmenting my songs in accordance with this era, this age. What is an ideal world? What is the truth? This is my course of investigation. This brings me to this new album. I have come to live with these truths we have heard, things that we’ve seen, things that happened- these have been put into another recording. I have come to understand that both the audiences and the performers have their expectations for the music. What do we hope for regarding content, meaning, and aesthetic? You could say we are each other’s inspiration. From a traditional instrument that had fallen out of favor and no longer performed its traditional function in Pgaz K’Nyau (Karen) society for decades, from a time where local melodies had faded from Pgaz K’Nyau communities, from a time when our stories no longer had listeners, we now have a surplus of culture. New beliefs and new cultures had long replaced ours under the guise of “development”. The artistic and cultural expressions of the Pgaz K’Nyau people were devalued and labeled as “underdeveloped”, giving rise to a so-called “Need” for new ways and beliefs. As traditional ways contradicted with the needs of development, some of our ways were obstructed to the point where our beliefs could not continue unhindered in these new social contexts. Thus, challenges arose. The course of progress advanced new worldviews and for communities that converted to new religions traditional belief and cultural expression that previously held our society together now needed to conform to new ideas. I stared with content. These are the stories, the tales, the legends, and the prophecies that I heard as a child. They link our past to make some unbelievable predictions that end up coming true. Some things that just seemed like make-believe children’s stories become things we now see. Some predict the future. These I have converted into lyrics to give the music a function, passing along Pgaz K’Nyau concepts, ways of thought, morals, and ethics that regulate our relations with each other, with nature, and with the supernatural. If the goal of religion is goodness, beauty and truth, I hope very much that it can co-exist supportively with the goodness, beauty, and truth of indigenous cultural ways, allowing for increased wholeness in every way. There were many people working behind the scenes on this project. My thanks are due to Mr.Todd “Tongdee” Lavelly, who brought in Sanu (Nu) Wanaphorn as producer. Thank you very much, Nu, for putting your heart into this and persuading Chaka to come to play the Pgaz K’Nyau bronze drum. This really set the mood. Thank you to my bassist, Eun, for staying true to the spirit of Pgaz K’Nyau music. 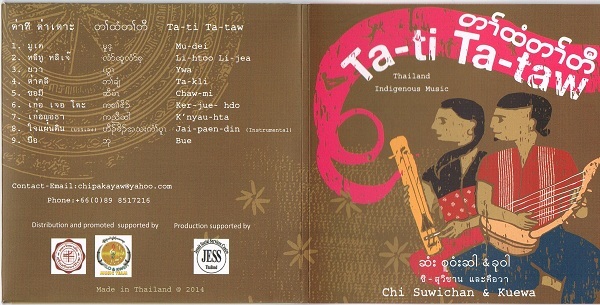 Thanks to Khru Jo Bringkop for adding the sound of the pi-u and pi-ba. Thank ou to Bom for the salaw (Northern Thai spike fiddle) additions. Thanks to the team at the Ching Mai Youth Community Center for coming to sing so confidently, and thank you to Siri Charoentham who brought the kola (percussion) in to record at the studio.My thanks also to Father Alfonso de Juan. S.J., at the Center for the Development of Quality of Life and Society, Xavier Hall (JESS- Jesuit Social Services Center), for helping with the funding of this production. Thanks also to P’Aoi Rodjaraeg, my sister who kept encouraging this dream. Thanks to P’Hbe Nabwong for assurance and help as soon as matters came up. Thank you to Phinon Kham Phawa for accompanying and inspiring me, like an ever present brother. Thanks to Mr.Benjamin Fairfield for supporting, encouraging, and always helping. Thanks to my grandparents and my parents for providing me with a place to learn the songs of our people during my childhood. Thank you to God, the provider of knowledge to my Pgaz K’Nyau ancestors who created our arts and culture. This is a heritage passed on from generation to generation, eventually reaching me. May you enjoin with Tati tataw by coulor music of Pgaz K’Nyau. Peace on earth. On a foggy day on the Thai-Burma border.